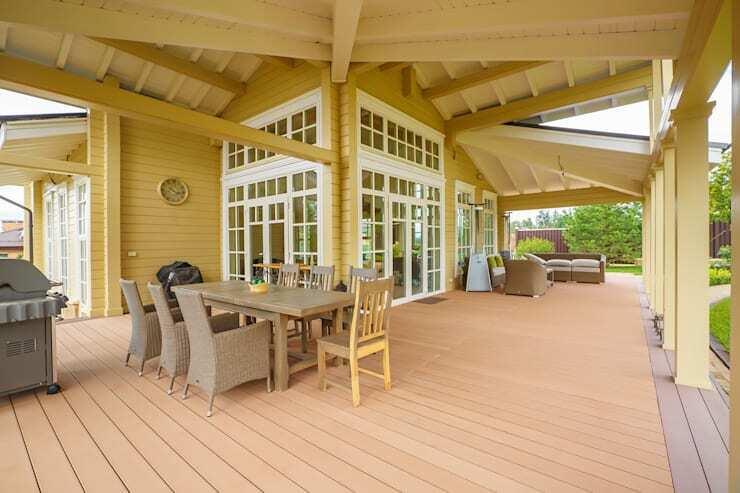 A semi-enclosed space, or even a sunroom, may be the best solution for your deck. 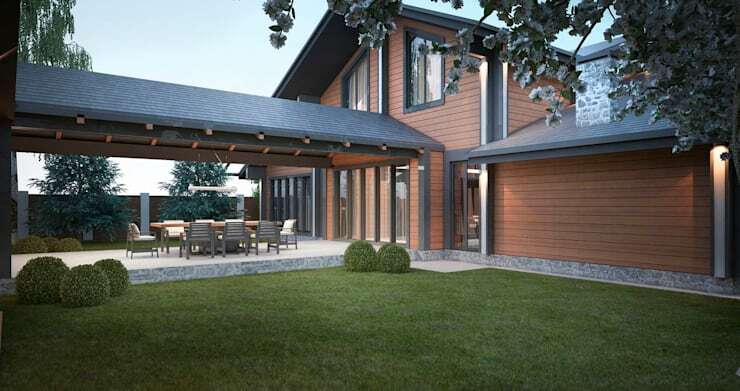 Covered by a pergola, an awning, or a porch cover, this solution is perfect for creating social spaces for the whole family, allowing you to enjoy lunch and dinner in the fresh air, but comfortably sheltered. If you're interested, consider these 15 magnificent porch projects by our architects. They are only for families who love the outdoors! Come and discover them! 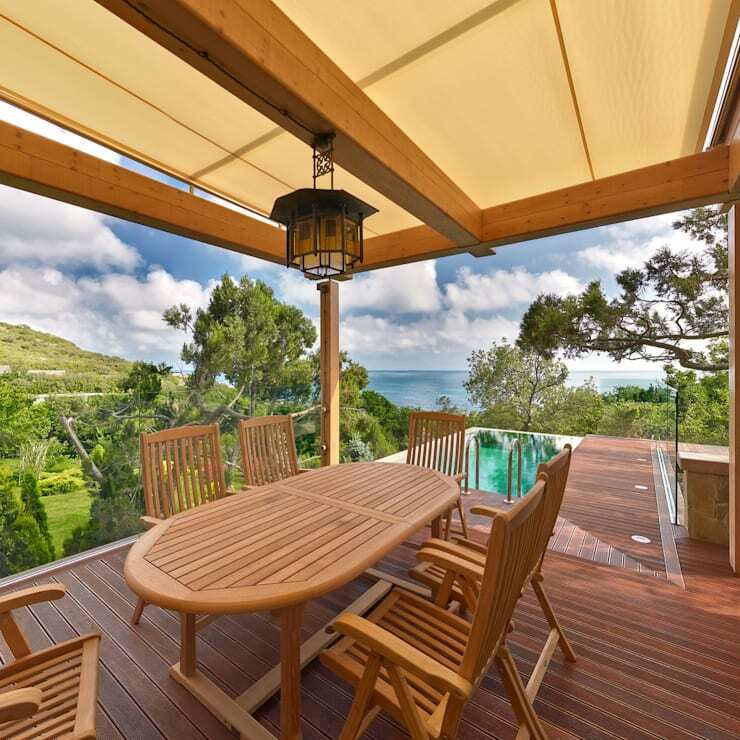 This deck has high ceilings and is decorated with simple and elegant outdoor furniture, to demarcate two distinct areas: a dining area and a relaxation area. This beauty has brick on the walls, tiles with regular geometric patterns on the floor, and a strong mint green L-table set. It's very retro. This porch overlooks a lovely scene. It is covered by a wooden structure with a fabric awning. 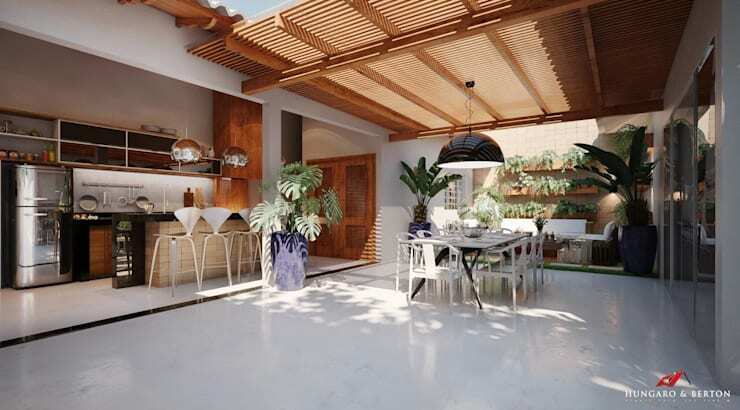 The wooden floor and furniture create a perfect space to enjoy the exterior with elegance and total relaxation. 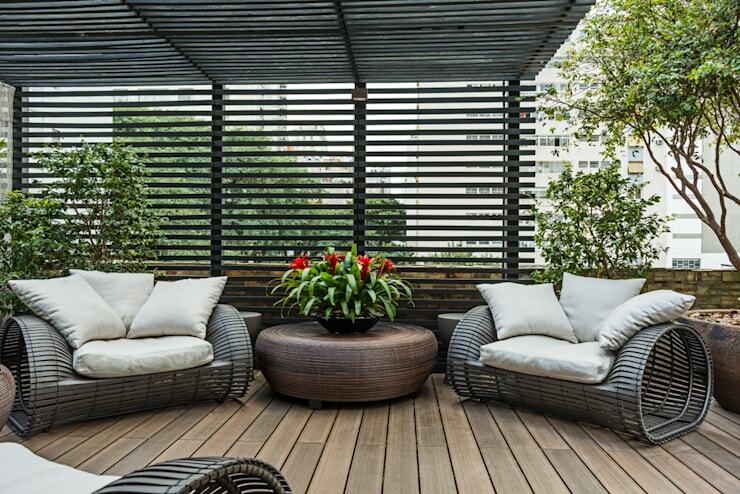 On the terrace, in the city, you want to cover up parts of your deck to maintain your privacy and tranquility. Wicker furniture completes this elegant and refined space. This beautiful structure is a minimalist porch, just suggesting the outline of a roof. It defines the space but leaves you to lounge in the sun. 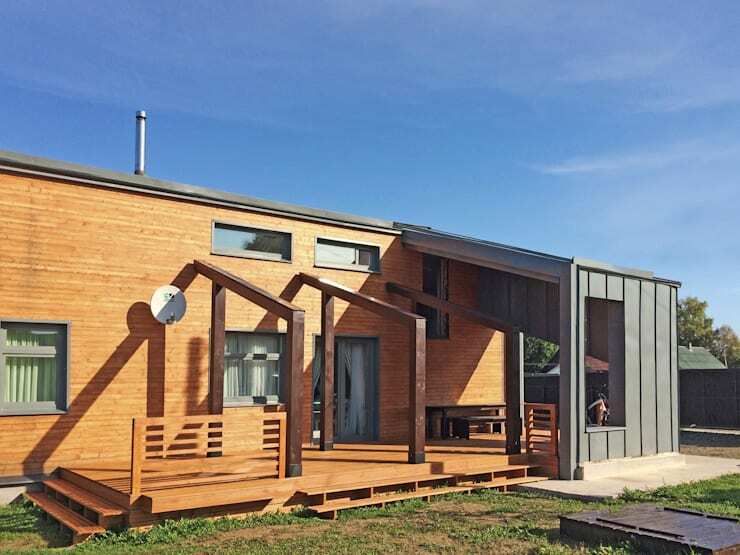 In this image we see a long porch that develops from the wall of the house, equipped with a dining room and a large outdoor living room, in direct contact with the extensive lawns around the house. The rear section of this house is occupied by a beautiful pool, attached to the house through a large sliding door. Above it, a natural wood roof with exposed beams adds a rustic feel to the yard. 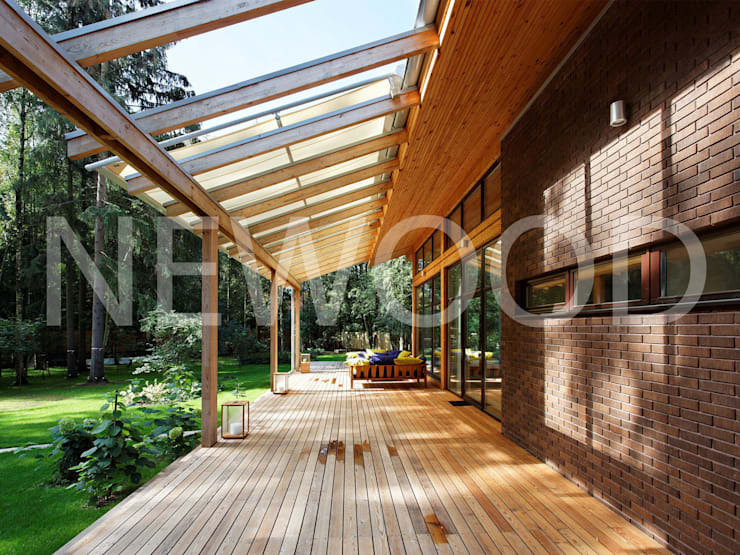 Natural wood, glass and brick give life to the spectacular balcony. 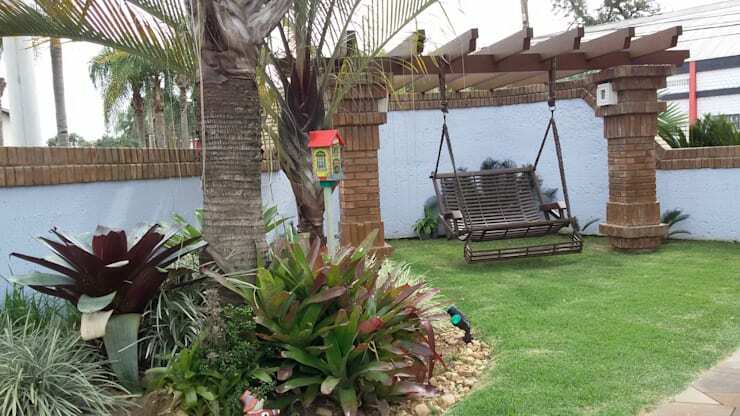 It has a fluid and organic connection to the garden environment, where you can relax and enjoy the tranquility of nature. The pergola, with brick and wooden beams, was finished with a suspended sofa: a real swing to rock in, gently on hot summer nights. 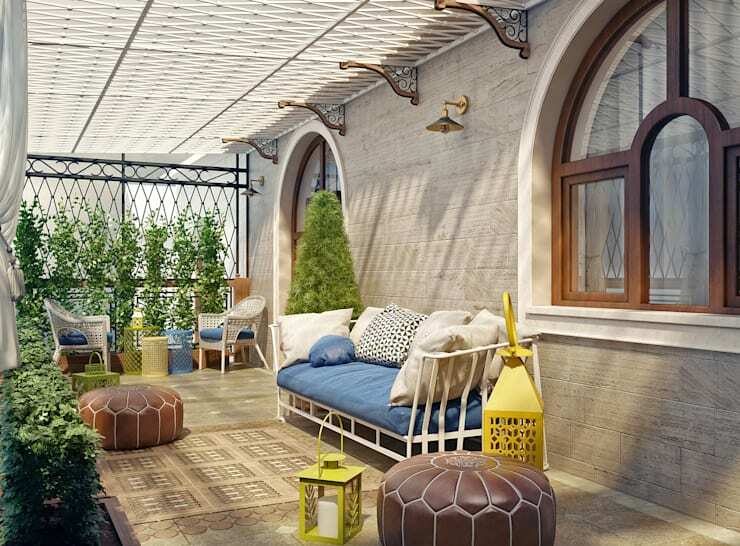 This stylish balcony offers a Mediterranean atmosphere. Leather poufs, a sofa with white trim, and seats in soft blue fabric with white cushions provide all the comfort you could desire. 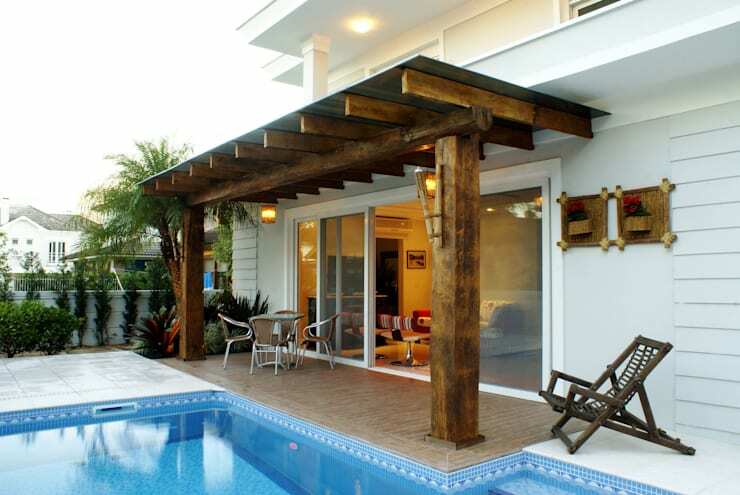 A modern design is what shows this porch with wooden pergola. 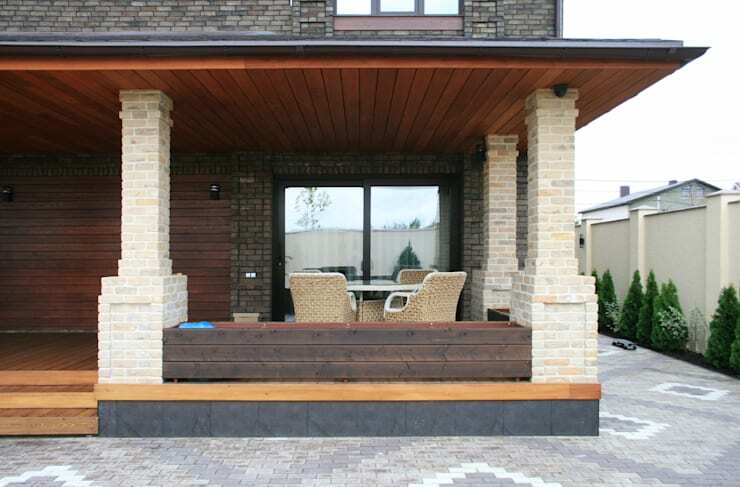 The porch develops from the stone wall, with wooden beams and metal, and fabric cover. Cut into a corner of the balcony, this is a space for relaxation. 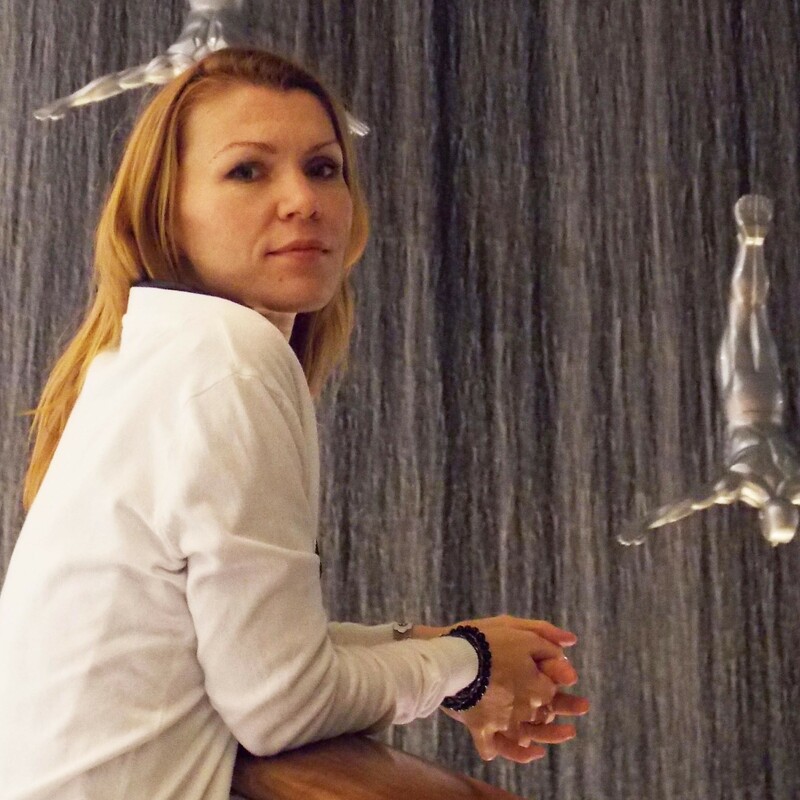 The stone offers a real sense of security, and a connection to nature. The elegant finishes beneath this wooden structure are excellent. There are high seats covered with soft fabrics, curtains to enclose the space, and a series of ceiling lamps with slender and and elegant forms. 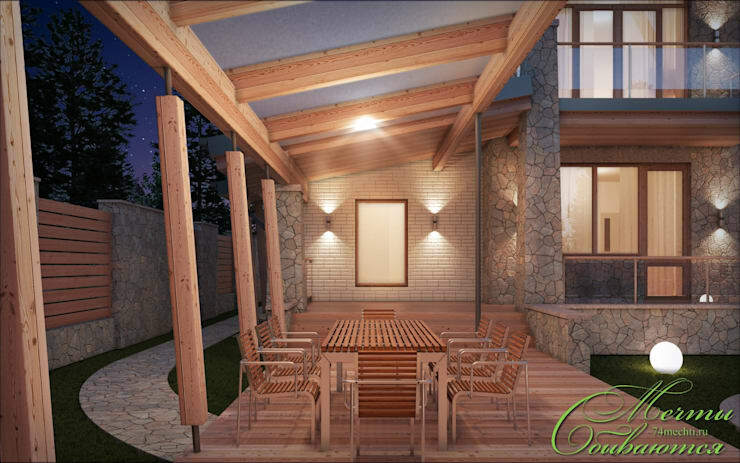 Another design for an elegant porch, with a light, light wooden roof, and a large endowed corner with tall stools, dedicated to the outdoor kitchen overlooking the dining area. 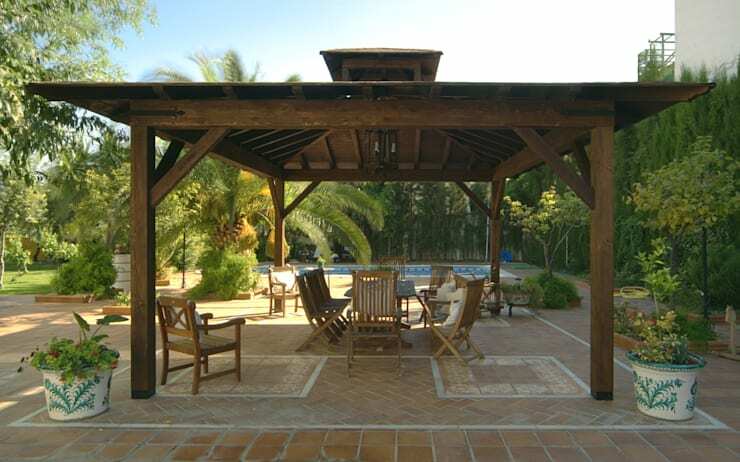 A rustic wooden shed, of simple beauty, accompanies the spectacular swimming pool in this beautiful garden. 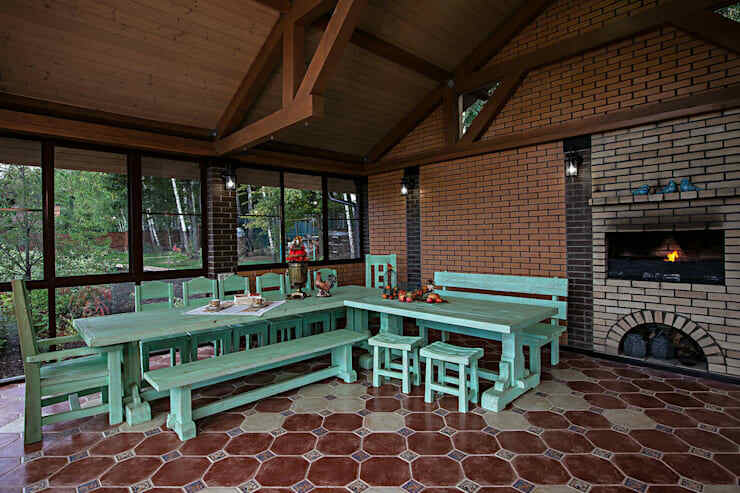 A tiled floor and wooden garden furniture completes this set. 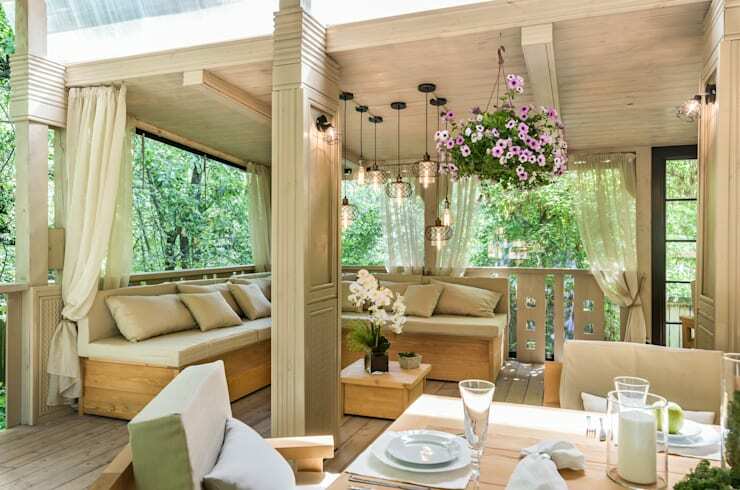 If you're ready to delve into a home interior, this Russian country home will surprise you.